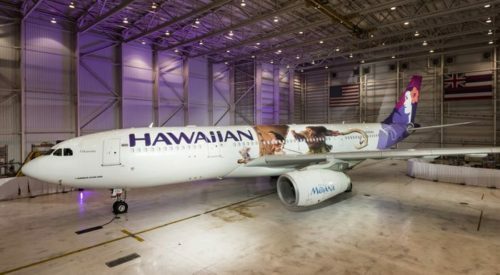 A new Hawaiian-themed Hawaiian themed move – “Moana” – is coming and Hawaiian Airlines is working with the Walt Disney studios to bring out three Airbus A330 aircraft with special livery. The design of the first plane has been revealed and it features the characters from the movie. The next two liveries will be revealed next month. All planes will fly on Hawaiian’s U.S. domestic routes and international destinations through March of 2017 and you can track where they’ll be here. As part of the collaboration Hawaiian Airlines will feature a “Moana” caption-contest , with a grand prize of a trip for two to Los Angeles to attend the Hollywood Premiere of Moana. Other movie-themed collaboration efforts include videos, Moana-themed amenities including luggage bins and inflight entertainment, as well as limited-edition products such as blankets, towels, and apparel.